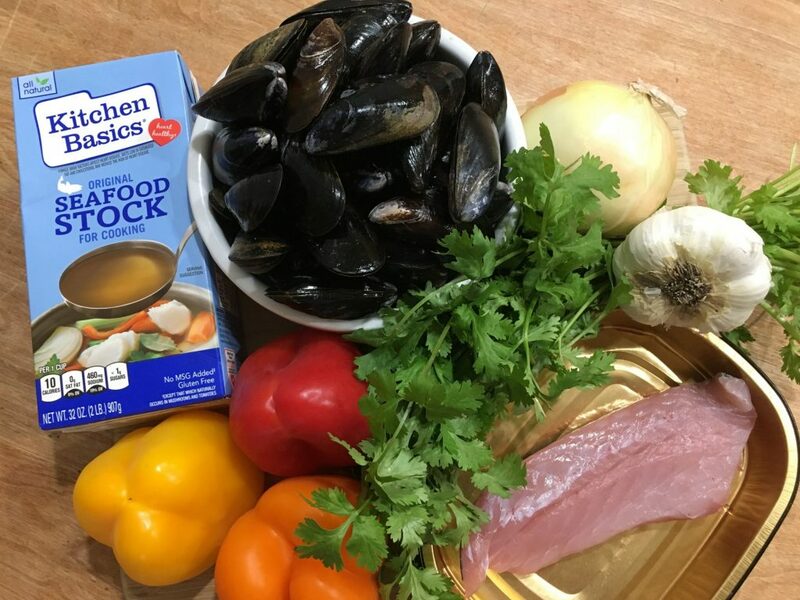 A Family Favorite, Our Seafood Soup Recipe! You’ll love our quick and easy seafood soup recipe. A long standing family favorite, especially as cooler weather temperatures arrive. Our seafood soup recipe is loaded with healthy fish and vegetables. We’re sure, this family favorite will become your family favorite as well. Healthy and delicious seafood soup recipe prep time is about 20 minutes. First, cut the vegetables. Second, rinsing the mussels. Then rinse and cut fish into smaller pieces. Then cook away! Cook time is about 45 minutes. The convenience of this seafood soup recipe is that you can adjust the recipe to your liking. Replace the Rockfish with the fish that you like. Or what is available at your fish market. In place of mussels, you can use scallops, shrimp, or even calamari. We typically buy seafood that is on sale or what is available at the fish market. It really is that easy to prepare. Likewise, the fresh vegetables can be changed to vegetables that your family likes. Carrots, corn, squash, or potatoes instead of bell peppers can be used. Add rice or pasta to this soup, if you family likes rice or pasta with their soup. The variations are many. Always use in seasonal vegetables for keeping this a budget friendly recipe. If it is on sale at the local produce market, then that is what we use. Your family will love this seafood soup recipe as much as ours does. Take a look and let us know what you think. Gather your vegetables for the seafood soup recipe. This includes produce such as garlic, onion, bell peppers, celery, and cilantro. Alternative choices for the produce can include carrots, corn, squash, potatoes. Or use your favorite vegetables. Collect your fresh seafood ingredients. Use your favorites like mussels, clams, shrimp, scallops and squid. We always add a fish, typically rockfish or monkfish which are our two favorites. But any white or flaky fish like Cod or Snapper will taste great. Next, select your packaged ingredients. Packaged ingredients include seafood soup stock, organic diced tomatoes, and black olives. If you can’t find a seafood soup stock, look for a clam or fish base that will give this soup its seafood flavors. As a tomato substitute, you can use fresh Roma or Plum tomatoes. You’ll need about 5 to 6 fresh medium sized tomatoes. Dice the fresh tomatoes before you add them to the seafood soup recipe. The black olives can be omitted, if you do not like olives. Wash and dry each of the produce ingredients for the seafood soup recipe. 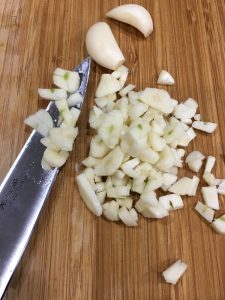 The garlic cloves only need to be peeled. Dice 6 to 7 garlic cloves into small pieces. Take one half of the white onion. 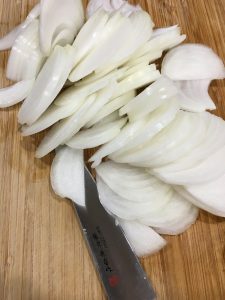 Cut the onion into smaller pieces. 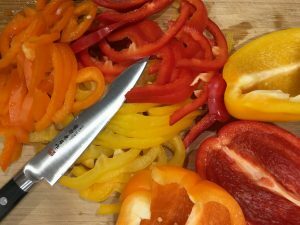 We remove the inner seeds pockets of the red, orange, and yellow bell peppers. Then cut the peppers lengthwise. Slice peppers thin if possible. This helps the peppers cook a little faster. Note: We like to include a variety of bell peppers in our meals. If you would rather use green bell peppers you can. Actually, green bell peppers are more budget friendly than the red, orange, or yellow peppers. Cut the 3 to 4 celery stalks into small chunks. Rinse and dry the cilantro or Chinese parsley. Vegetables such as carrots, squash, and potatoes need to be cut into smaller pieces before cooking. 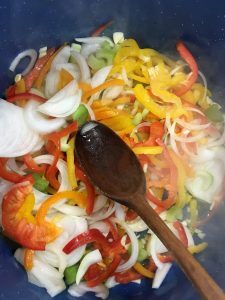 Easy Seafood Soup Recipe for a Hearty Winter Meal – In a large Stock Pot, add chopped garlic, onion, and sliced peppers. In a large soup pot, add olive oil. Heat the olive oil on medium heat. Gently stir in the garlic and onions. Saute onions until the onions start to wilt, about 3 to 4 minutes. Next, stir in the red, orange, and yellow peppers and celery. Cook for another 5 to 7 minutes. The onions will begin to brown. The bell peppers will have softened. Immediately stir in some cooking wine or sherry to de-glaze the peppers and onions. Pour an additional cup of dry white wine or cooking wine to the pot. Add 1/2 of the seafood stock. Bring the soup back to a boil. Then, drop all herbs including salt and pepper into the soup mix. 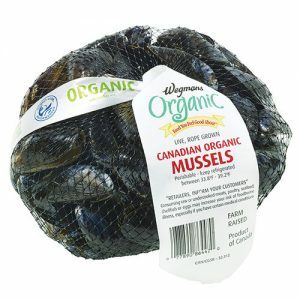 Rinse and clean your mussels, clams or other molluscs you are using. Drain and lay them on top of the peppers and onions once at a slow boil. Reduce heat to medium. Immediately cover. 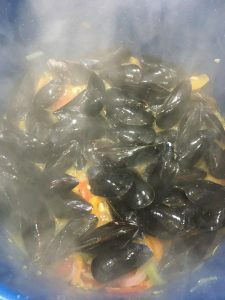 Let mussels steam over medium heat for 4 to 5 minutes. Check to see that all clams and mussels have opened. Remove just the mussels and clams from pot using tongs. Place mussels or clams in a large bowl. Cover bowl and keep warm. Pour the remainder of seafood stock. Next, pour the tomatoes and fish (and any remaining fresh seafood like shrimp, squid, etc) to the stock pot. Under medium-low heat cook until tomatoes are tender. Approximately for 10 minutes. Turn off the heat. 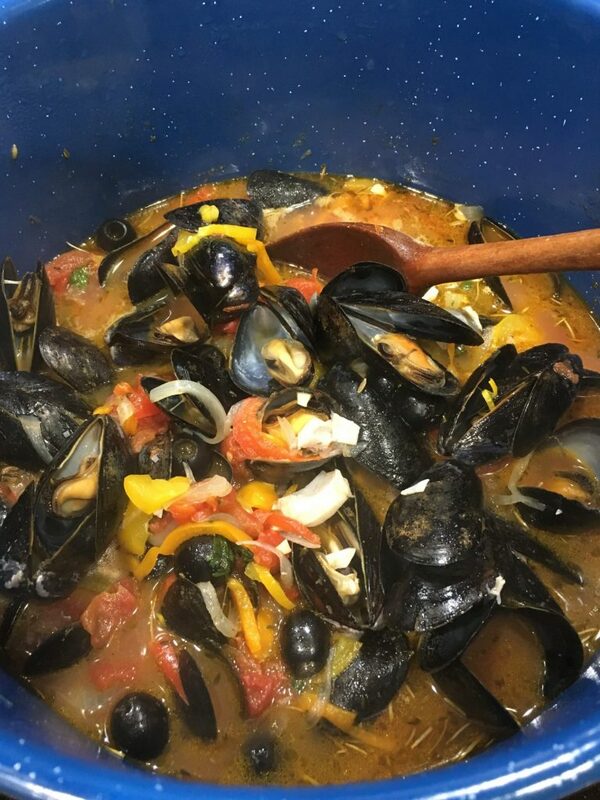 Carefully pour all mussels or clams back into the stock pot. Gently stir into the mix. Note: Excessive mixing or stirring will break fish apart. Replace the lid on the stock pot. Allow seafood soup recipe to sit for 3 minutes. Serve immediately. Enjoy! We remove the molluscs to keep them tender. This prevents them from overcooking. Some recipes call for them to remain in the pot. This allows the mussels to absorb the wonderful soup flavors. 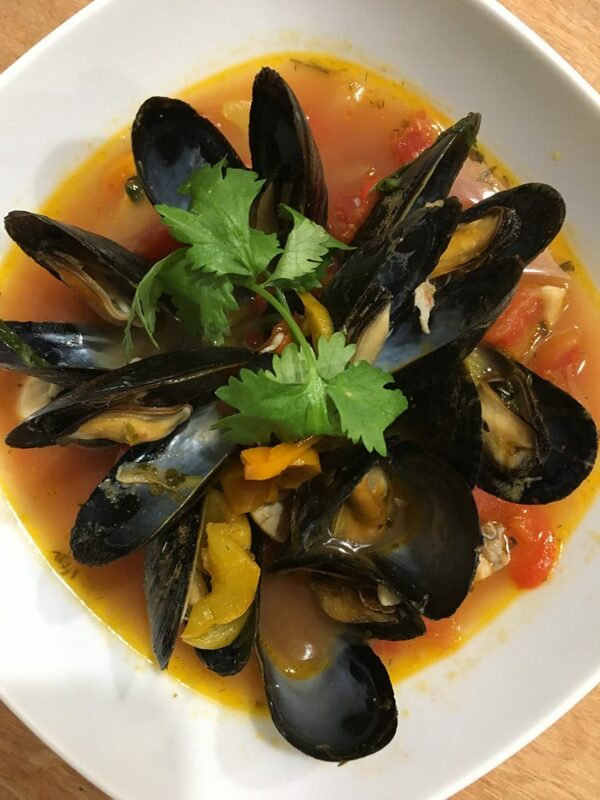 We have found that mussels may get chewy if left in the stock pot for over 15 minutes. 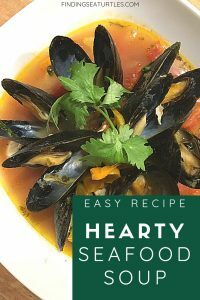 Remember, you can adjust this Seafood Soup recipe to include your favorite fish, seafood, or vegetables. Check and see what produce and fish is seasonally available at your local market. If you find your fresh options limited, frozen seafood can be substituted as well. If you have a Seafood Soup recipe that you like, please consider sharing them with us. And if you try this Hearty Seafood Soup recipe, let us know how you make out in the comments below! Some of our other recipes.